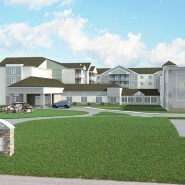 The Falls is a new, forward-looking rental apartment complex currently being built by JMS Collective in Greenport, NY. It's located minutes from historic downtown Hudson and the organic farms and parks of Columbia County. The complex will have a total of 20,000 square feet of indoor common area space and 190,780 residential living space, all set on a 22 acre parcel with extensive walking trails. Incorporating part of a historic schoolhouse, the innovative apartment complex will offer a total of 116 one-, two- and three-bedroom apartments and lots of amenities such as swimming pools, a spa, tennis court, dog run, playground, gym, movie theater and more--all included with rent.